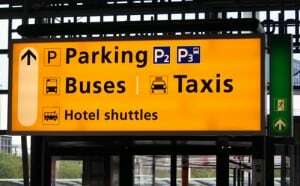 When most people think about hiring a ride to get to the airport, they think taxis or airport limos. That makes sense for lone travelers or a family but for a group, not so much! There’s a few reasons why you should consider renting a school bus to get your group to the airport. Here’s the top 3! OK, a school bus is not more luxurious than your Lexus (or even your Chevy) but it is way more convenient. School buses comfortably seat 48 adults and if you’re within Greater Toronto; a ride to Mississauga’s Pearson Airport or Billy Bishop City Centre Airport or other neighbouring airports are just a short ride away. Isn’t it a luxury, though, to get dropped off at the departure entrance and picked up at the arrivals exit without having to hunt down your car, luggage in tow? The door to door service can’t be beat and you don’t have to hire a limousine to get this service! This makes even more sense if you are traveling with children – we know how that goes. So we agree that door to door service is the ultimate way to handle getting to and from the airport – but how about cost? School bus airport shuttle service is by far the most cost effective method, and gets even cheaper as your group size grows. If travelers in your group even considered off-site park and fly airport parking options, you’d see that the cost for a few days worth of parking may cost more than renting a school bus. Of course, you’d get none of the convenience of departure/arrival door to door service, right? Cheaper and more convenient airport transportation is enough, but there’s more! 3. Riding with Your Travel Mates is More Fun and Relaxing! Whether you’re traveling for fun or on business, traveling as a group is more fun. Business travelers can spend time talking shop or better yet, not talking about work and simply having a good time. If you’re traveling with friends and family going as a group is the ultimate way to get a vacation started early. Of course, school buses are much safer than passenger cars and you have none of the stress of commuting and parking. It’s Time to Rent a School Bus for Your Airport Travel! Although you may not have thought about it before, you’re now convinced…there’s no better way to get to and from the airport. Think yellow – think school buses for airport transportation! If you’re considering renting a bus for your group travel needs, then contact us today. Yes, we even have executive coach buses if you really want a little more luxury, too!